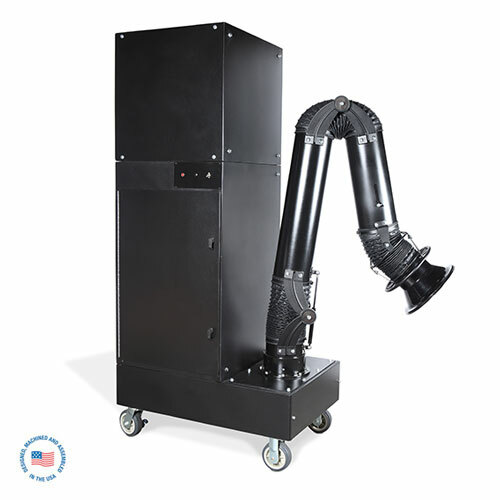 The Extract-All™ Model SP-4000BWC Mobile Fume Extraction System is designed for direct source capture of various airborne contaminants. The SP-4000BWC is ideal for Heavy Vapor, Smoke and Mist Removal from Industrial and commercial facilities. It is an efficient and cost effective method of handling applications that require maximum portability and performance. The SP-4000BWC operates by collecting the contaminants t via an 8” diameter by 7’ long externally-supported, articulating fume extractor arm that filters particulate through a MERV 14 Particualte Filter that is 97% efficient at .3 microns. Harmful vapors are contained by a deep bed refillable chemical adsorption module with activated carbon. The Extract-All™ Model SP-4000BWC Portable Fume Extraction System offers the utmost in versatility and high efficiency in a compact design.